Investing is hard. For starters, there’s detailed analyses and quantitative rigor that go into every sound investment decision. And then, to make matters more challenging, we are constantly battling our instincts, which are often pulling us in conflicting directions and getting in the way of sound investment discipline. To this end, we must find an equitable balance between the fear that tugs at us when markets are down and the greed that tempts us in an upswing. This holds especially true today as markets scale new peaks, lulling us to believe that these heady times are here to stay. Prevailing asset prices and our long-standing experience tell a different tale, suggesting a major correction is due. At NEPC, we don’t see an imminent correction around the corner as underlying economic conditions remain strong, but we do advise caution. We believe US equities appear fully valued but could get a further leg up amid continued economic momentum; bonds, too, seem to exist in a bubble, but we can envision tighter spreads and lower coupons. We think this pervasive optimism should be used as a catalyst to make way for a healthy dose of skepticism. We aren’t advocating an abrupt and dramatic scaling down of risk; rather, we are suggesting prudent risk management, particularly in tightly-priced assets, for instance, high-yield debt. To us, this may be a time to rebalance, take some risk off the table and rethink your portfolio’s overweight positions, no matter how tempting it may seem to leave things as is. This behavioral conundrum is not new. In 2009, when the world was reeling from the aftershocks of the global financial crisis, investors faced a critical decision: adhere to established rebalancing rules and seriously consider investing in risk assets with very attractive valuations (but perhaps poised for more losses) or hold out for signs of stability. Investors in a position to act and take on market risk during the early stages of recovery were rewarded tremendously. Their decision involved overcoming fear while sticking to a disciplined plan of rebalancing, maintaining market exposure or, potentially, increasing market exposure if risk positions had been reduced prior to or during the crisis. Fast forward to 2016, US equities were in their eighth year—now going on 10—of a bull market but many portfolios were in a relative crisis. Diversifying assets, including emerging markets stocks and bonds, real assets and active strategies, were underperforming traditional US equities-focused portfolios. Fretful investors wrestled with the question of whether these positions still made sense, doubting the relevance of diversified and risk-balanced portfolios. If this doubt chipped away conviction in portfolio positioning, it would have resulted in a capitulation to a more traditional mode of portfolio allocation away from diversified assets. Acknowledging this conundrum, we published the Disease of Doubt, where we talked about doubt being healthy as it provides an opportunity for fresh analyses of market conditions. NEPC’s analyses reaffirmed that these challenged assets have a place in investment portfolios. To this end, we urged investors to maintain their investment discipline and work through behavioral biases; those who did, have been rewarded so far. 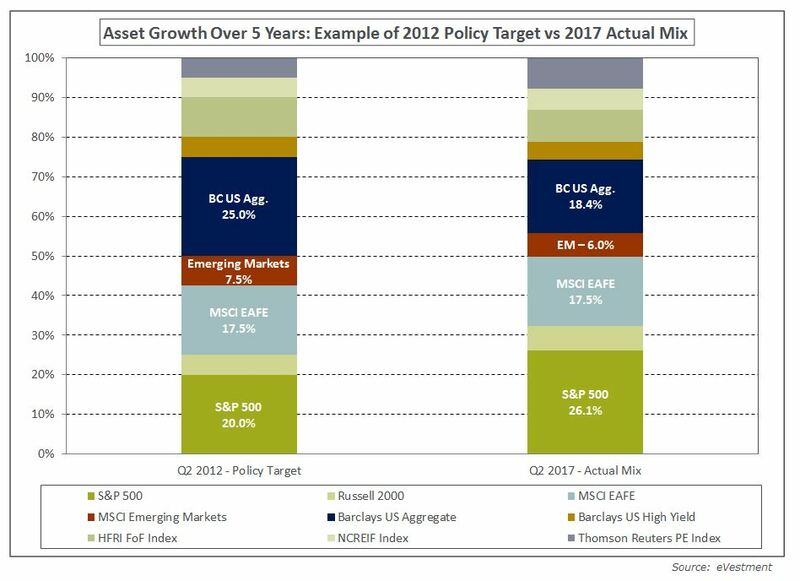 Coming to 2017, most asset classes have not only outperformed expectations, but also outperformed for an extended period of time. Investors who re-underwrote positions and remained committed have been rewarded. These investment gains help support the mission or objectives set forth for a pool of assets, including providing services/education to a community, paying promised retirement benefits to deserving participants, and growing the assets to support a long-term goal. Strong investment performance also creates challenges: it alters the future returns in these markets if the underlying catalysts driving the investment gains remain unchanged. This pulls growth forward to today, creating higher prices, but it limits upside for the future. At the same time, it also creates a behavioral challenge, festering greed amid the desire for continued gains. Fortunately, the way forward is simple: Investors must assume a disciplined approach to constructing portfolios and rebalancing towards long-term targets. This methodology is akin to exercise and a healthy diet for our bodies. Advocating a disciplined approach to constructing portfolios and rebalancing towards long-term targets is a timeless message. So, why are we writing about this now? Are we saying the bottom is going to fall out from this multi-year bull market that has bolstered investments across the globe? Just to be very clear: We are not. Nor are we advising investors to time the market cycle. We cannot be sure when the cycle will end. In fact, strong performance alone is useless in predicting when to scale back exposure to markets. 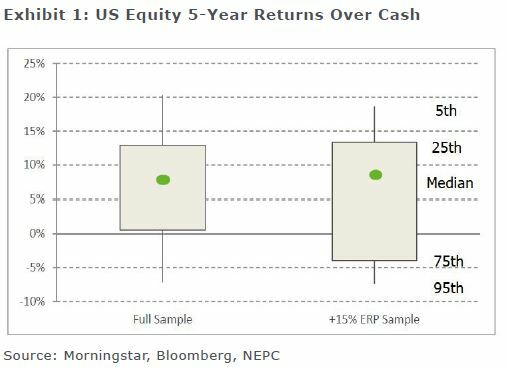 In line with our observations, we show the range of excess US equity five-year returns over cash for a full sample since 1926, and then for five periods following a five-year excess return greater than 15% (Exhibit 1). Intuition may lead one to expect that after a strong five-year run, the next five years of equity returns would be unlikely to keep pace. In fact, it is clear that there is little difference in expectations and upside, but worse downside. This is exactly why one should rebalance: If expectations are similar but with the potential for a more severe downside, it makes scant sense to maintain an overweight exposure when the probability, based on history, implies a higher likelihood of negative outcomes. An investor may or may not be more exposed to a period of negative returns, depending on economic and market conditions. Absent perfect foresight, we can only assume we are just as exposed to these downside scenarios (and we should all probably be slightly wary and cautious that the longer the cycle runs, the more likely the probability of a negative event). With that in mind, we should capture gains in portfolios and exercise discipline in rebalancing. To this end, we sell the best-performing asset, usually above expectations, and buy the assets that have performed the worst, usually below expectations. But what happens when almost everything is outperforming? In Exhibit 2, we show a portfolio, at target at the beginning of 2012, and how it likely shifted due to performance over the course of the last five years. Buying US bonds is a little different. They have generally outperformed expectations (once again) and their future return projections continue to be subdued. Much like our thoughts on hedge funds, high-quality bonds are in a portfolio for a reason, and a disciplined rebalancing strategy insists on their inclusion. So, with bonds playing an important role in portfolios, we would recommend buying back to target levels. To the extent TIPS are part of a portfolio, or there is need for strategic exposure to inflation-sensitive assets, these securities deserve strong consideration within a fixed-income allocation or as an alternative to high-quality nominal bonds. Absolute-return fixed-income strategies may be another alternative to traditional fixed income, worthy of further review. While there’s a clear case for rebalancing, we recognize the challenge of selling a set of markets that have gone up, only to buy other markets that have gone up. It does not feel very contrarian. This is the real challenge of investing in today’s environment, where the idea is to not just rebalance, but also proactively reduce risk as all markets stretch. This is not to say investors abruptly move to cash or sharply cut risk exposure, but as this cycle continues to extend, we think it makes sense to assess dialing back risk. We think moving back to portfolio targets and risk posturing reflects sound investment discipline. Some investors, having captured significant gains recently, may consider a modest risk reduction. We also think it should be considered along a continuum. A moderate risk reduction today may indeed be in the face of further gains. As those gains further extend market pricing, a more meaningful risk reduction may eventually be required. As this continues, an investor can feel very uncomfortable scaling down risk as conditions remain strong. We acknowledge this challenge as markets could run for several more years. Yet, we believe this difficulty is trivial compared to the challenge of timing the market. While we don’t know when markets will shift, we do believe they will. This assessment is a key focus for us as we finalize our 2018 outlook and assumptions, and we look forward to sharing these views with investors in the coming months. All investments carry some level of risk. Diversification and other asset allocation techniques do not ensure profit or protect against losses.